This appendix of the Commercial Production of Staked Tomatoes in the Southeast guide will help growers identify the source of many of their tomato plant problems. N.C. State University provides photo examples associated with a wide variety of symptoms and diseases of tomatoes. This toolkit is an educational resource to teach pesticide safety to Spanish-speaking agricultural workers with limited formal education. The toolkit was approved by the U.S. Environmental Protection Agency for federal Worker Protection Standard worker training requirements. 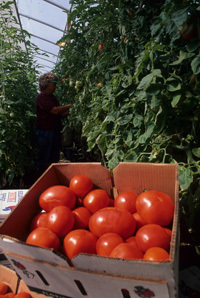 Toolkits are available in Spanish and English for a variety of crops, including tomatoes.